It is surprising (AKA ridiculous) how political posturing and theatrics can move a market. We truly have little idea how the economic recovery is coming along due to the lack of fresh data. However, we do know that our politicians led us to only a minor self-inflicted wound instead of something more catastrophic. Yay! (Hopefully, you sense the sarcasm). We've recently read several comments and editorials regarding the current valuations and multiples of the equity market. Although we are nowhere near the high flying 2000s we are seeing some similar warning signs. For example, some of the "hottest" stocks today are firms that have yet to make a profit, or are turning very meager profits (think Tesla, facebook, Twitter, Linkedin). 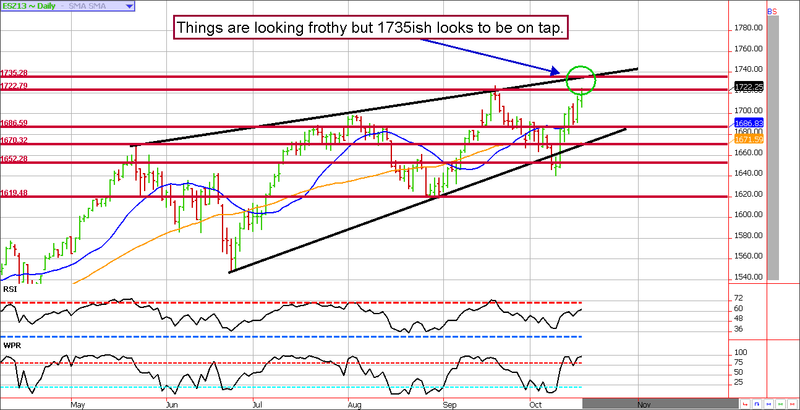 Simply put; there is certainly a lot of froth in the market and this is reason to be on high alert. On the other hand, the market is just now getting the opportunity to react to the confirmation of the first female Fed Chair, Janet Yellen. She is known for being VERY accommodative; this will likely keep the money printing presses running. Naturally, more quantitative easing is supportive to asset prices...particularly Treasuries. Treasuries are running, and we doubt the rally is over. As Rick Santelli pointed out this afternoon; yields on the 10 year note are "wildly" higher than they were in the spring (meaning prices are far lower). As a reminder, the jump in rates was primarily triggered by "taper talk". We might be dumb, but we aren't stupid. We know the Fed will eventually begin cutting back on their stimulus programs (particularly bond buying programs) but this month's debt ceiling debacle has likely set them back several months. Don't forget, the Fed's taper was "data dependent"; because data lags the economy by a few months it will take quite a bit of time before they know what damage this month's political folly has caused. In the meantime, QE to infinity and beyond! **Consensus:** 134 resistance was seen in Thursday's session. 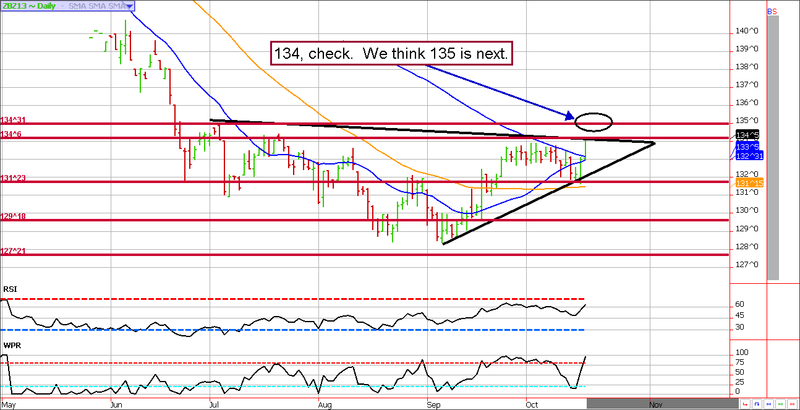 Friday's are notorious for counter trend, so we could see some back and filling but we still think 135 will be seen on this run. I think most will agree that the S&P has probably come a little too far, a little too fast. Nonetheless, we are certain there were a substantial number of unsuspecting bears caught with short call options (most likely the 1700 strike). These traders are painfully scrambling to buy futures to cover the risk on their short calls...as a result, they are propelling prices higher. Markets have a tendency to reach a climax near option expiration, only to reverse course (even if it is temporary) in the following week. We suspect that is what could be playing out here. If the market is in fact running out of steam, any selling likely wont' be seen until after tomorrow's option expiration (early next week). We'll be looking for a place to sell call options against this move in the next day or so. **Consensus:** We'll be shopping around for calls to sell in the next day or two.